Is it possible to write on this OTP area at run-time under user program control or is it writable at the chip-flash time only? I have tried to search this detail in the document but i cannot find it. Yes. There are some details in section 3.8 (page 97) of the reference manual. In brief, the OTP area behaves similarly to other parts of flash memory, except that it cannot be erased, and it contains a set of fine-grained lock bytes which can be used to prevent further writes. Not the answer you're looking for? 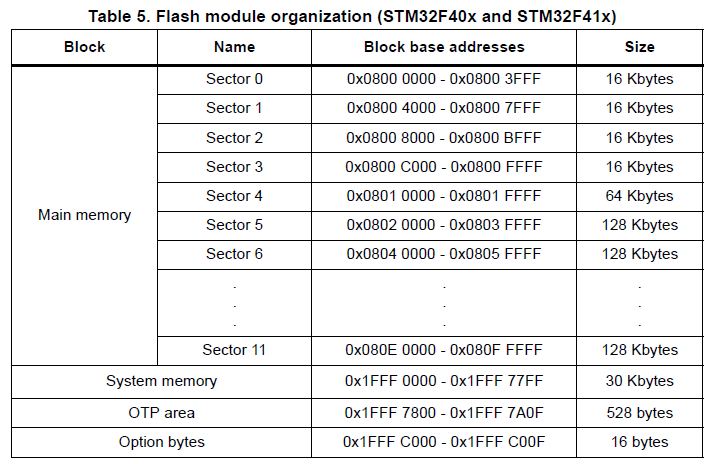 Browse other questions tagged microcontroller stm32 memory flash stm32f4 or ask your own question.